Venezuela News And Views: Can Capriles campaign square the circle? ".....who know that they will not be able to avoid jail in a post Chavez era". They will likely get a pass. Capriles strategy is to win without making too much waves. Once elected he will try to get this country back together again, at least that is what he is implying these days. Not only the corrupts will not go to jail, they will get to enjoy their ill gotten riches. Anything short of that will likely be considered as revenge. Sad but probably the least damaging path. I think that this time around they are not going to get a pass. True, they may not go to jail but the extent of chavismo robbery cannot go unpunished. They will have scapegoats? They will be politely asked to move out of the country? They will be asked to return funds in exchange of leniency? The challenge is to make it look like justice and not revenge but I can assure you that if the new administration does not hang at least a dozen chavista not only it will have an even harder time to control chavismo crowds but it will lose fast support among its own ranks. If Capriles wants to reach 3 years of administration he will need to hang a few. A short list that should not bee too difficult to to condemn without major trouble includes Rafael Ramirez and a couple of PDVSA "managers", a couple of the current sitting "justices", a couple of bolibourgeois. Granted, they probably will need to let Diosdado and Jaua and even JVR go unscathed but they need soem blood somewhere. Times have changed. Before the AD and Copei had equal burdens of guilt but this time around it is not the case because chavismo has made the fatal mistake to split the booty with Cuba only, no crumbs for our side. Speaking cynically of course. I missed this when you wrote it, Daniel. Lots of great analysis, but I hope you are wrong that people would abandon a transitional democratic government which did not "hang" Chavistas. Or that "they need some blood somewhere". The blood of which you speak would simply become a grievance, a talking point, and a source of political power for the Chavistas who are defeated "por ahora", but hope to come back to haunt you. Lovely, rich commentary, Daniel. Thank you. Learned something I didn't know (squaring the circle). Capriles' sweat equity (literally plus figuratively) and seeming results (adherents, fixing the agenda of opinion so that Chávez responds to it), defines his mature vision and provides a mechanism to unify a country that has been politically and socially fractured for the past 13 years. If Capriles wins, and I very much hope for that, he won't be able to do much in 3 years. But even if he can make a strong dent to reverse the patterns of crime, food importation, and of course, education, this would go a long way towards rebuilding the foundation for the next administration - may it not be the immature chavismo anytime soon. I think Capriles has carried an EXCELLENT campaign. Unfortunately, he is not helped by the MSM who attack Chávez without putting Capriles upfront. IMHO Capriles has a serious chance to get elected. The reason? Because Chávez cannot grow: his numbers are his numbers. In 2006 he still got some support from the medium class. I don't think that now he will get any. And what is the "medium" class seeing in its crystal ball this time around? He's doing a terrific job & for the first time in years we have a real chance of winning with a comfortable margin. Esto fue en Las Mercedes del Llano, el primer pueblo visitado por Capriles en Guárico, hoy! Further to my comment yesterday here's more evidence of the erosion of Chavez support. First of all the appearance of Chavez yesterday in the rojo-rojito zone of El Valle/Coche was a total disaster. No one showed up (a few hundred at best), the locals had a cacerolazo (banging of pots & pans) in protest & after the appearance 2 gangs got in a fight that left 2 dead. In the meantime the soon to be president HCR had a great day with 1000's in the streets & a strong message. For Saturday Chavez is supposed to go to Petare, another Chavista stronghold. The word is that all government employees are obligated to show up. Not looking well for El Supremo! Good article, Daniel. I, however, tend to think that the religious pro-Chávez zealots are close to 40%. Kidding aside. I used the 40% loosely but I am not so sure anymore. I think, watching the "quality" of the campaign that we may need to split that 40% into a group of "do or die" and a group of "I am too scared to look for something else and to recognize that I have been wrong all along; and besides I need my job and the corruption that comes along". that later group may not be ready to vote for Capriles yet but they are ready to stay home of needed. they did it already once, in 2007. My 30% is thus the chavistas that are going indeed to vote for Chavez. And I mean going to vote, and punch the Chavez button. that difference between 30 and 40% are those who have not decided truly that they will go to vote but reply to pollsters that yes, they will vote for Chavez if they go to vote on October 7. Maybe I am optimistic? But do note that I am giving Capriles that same 30% that will vote for him no matter what, thus recognizing the evenness of the race at this date. One of the comments to the first link says there were 400 to 500 security guards in crowd. Add to that those government workers who were forced to attend. 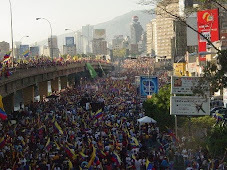 What about those who just watching the spectacle but are not Chavistas. Then how many people really were there just to support Chavez? The above comments by Anonymous are in response to Island Canuck's comment three up. Not a good tactic in the long run....too much temptation for the skullduggery to continue as the powerful will remain so even though under a different name.As long as people are voting for freebies and are lacking in consciousness,I see no real remedy possible. As time passes it only becomes more and more difficult to confront the status quo. Without a real change, the faux change will end up :"plus ça change, plus c'est la même chose". is that the best Venezuela can do?